It's undeniably fast and very capable with lots of features and upgrade options, but this four-bay small business NAS is expensive and others can do much the same for less. 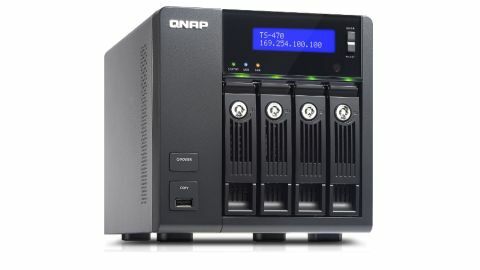 With a price tag of just over £700 (around $1,180, AU$1,270) before taxes and without any disks, the QNAP TS-470 is a far from cheap four-bay NAS appliance, very much aimed at the small business rather than home user market. Even then it's expensive and for that money we expected a quality product with lots of extras beyond basic network file sharing. We weren't disappointed, but felt that some of the options were beyond the needs of the intended small business audience. We knew we were dealing with a quality product as soon as we unpacked the TS-470. Weighing in at a substantial 10 pounds (4.5kg) it's both solid and extremely well built, designed to sit on a desk or shelf with power delivered through an external AC adapter. Power consumption peaks at just over 62W dropping to around 30W in standby and there's a single large fan for cooling which, even when pushed hard, makes the QNAP appliance quiet enough for use in an open plan office – although you wouldn't want to sit next to it. The QTS operating system needs to be loaded onto the appliance before you can use it and we particularly liked the way this can be done via the cloud, simply by browsing to the URL printed on the label on top of the device and entering the unique key provided. The required software is automatically downloaded and quickly configured using a startup wizard, with the only negative being the need to then update to the latest release, rather than installing this version to start with. We were using the business-ready QTS 4.1 operating system which, with its desktop look and feel, is very much like the DSM software employed by market leading rival Synology on its DiskStation products. Equally easy to learn, this provides support for both cross-platform file sharing and iSCSI SAN connection to remote servers, and is packed full of features to manage storage as well as take backups of the NAS appliance itself and servers and desktops on the LAN. The QNAP appliance can also act as a domain controller on a Windows network and, just as with the Synology platform, host additional apps to further extend the available functionality. Some, like a web server and antivirus scanner, come pre-installed. Others, like the WordPress CMS and QNAP's own Surveillance Station app for use with network cameras, need to be downloaded from the QNAP App Centre and may require additional licensing.